When the clouds finally cleared from overhead, they were replaced by clouds upon the ground. I stood in my driveway looking up at the stars arrayed above while fog swirled around my feet. These are not ideal conditions for observing, but at least the stars can be seen, whereas the clouds had been blocking all manner of wonders, including the recent aurora, for nights on end. My goal has been to find Comet Jacques and – spoiler alert – I still have not accomplished it. Even though I’ve used the finder maps and zeroed in on exactly where it should be, I’ve been unable to make it appear in either binoculars or my 8-inch telescope. I began my search with binoculars again, because who wants to tote out the giant telescope if my target is within range of 10×50 binocs? As I starhopped across the sky overhead, I ran into the lovely Coathanger Cluster. This is a great collection of stars to share with newbies, because the cluster looks exactly as you would expect. In fact, if you simply put the large grouping in a finderscope and usher a friend to look without saying a word, he or she will likely exclaim that it looks like a coathanger. But the comet was not appearing, so it was time to bring out the big guns. Besides finally having a clear sky, the night of September 15 was also fortunate in that Comet Jacques was supposed to be very close to the star Albireo. Unlike most stars which look nearly identical through the eyepiece, Albireo looks like that familiar pinpoint of light through the finderscope and then when you use the telescope’s eyepiece, two stars appear: a larger yellow star and a dimmer blue sparkler, probably the most magnificent double star in the heavens. So when I’m sweeping for the comet and have gotten too far away from my starting point and need to go back and begin again, Albireo is the perfect twin signpost to use. Yet I never found Comet Jacques. To test if it was the conditions of my local sky (pollution, the moisture surrounding my telescope) that made me unable to see Comet Jacques, I swung the telescope a constellation away to Lyra, to track down the Ring Nebula, M57, which shines at magnitude 8.8. Some reports of Comet Jacques pegged it at 7th magnitude, so if I can see the Ring I should have been able to spot Jacques. 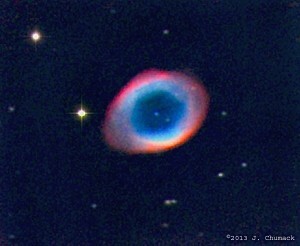 The Ring Nebula did make an appearance through my scope. It looks very much like something out of an eye test. The optometrist shows you a picture through the lens of his machine and asks, “Which of the four circles appears to be coming at you?” The Ring Nebula is a blurry, circular patch of light that has a three-dimensional structure that appears to be poking out at you from the background stars. But it is dim and diffuse, so it won’t grab your attention unless you’re looking for it. Later research on my computer revealed that Comet Jacques is probably shining at an unobtainable magnitude 11.4 at the moment, thus I’ll have to select a newer, brighter comet to track down next time. I have found it necessary to update each comet in Stellarium before looking for one of them. Even a slight alteration in the ephemerides can make the difference between finding and not finding the target.